I have a not-so-secret love of drop spindles. I sometimes ply on one even after spinning the singles on my wheel. It takes longer, but I’m practically guaranteed to get a balanced yarn since I check the twist every three feet or so, when I wind the yarn on to the spindle. Top whorl spindles. By “Pschemp” from Wikimedia. Drop spindles are simple, really just a straight stick with a notch or hook on one end, and a weighted disc. The two commonest types are bottom whorl and top whorl. The difference between them is the location of the disc, or whorl. 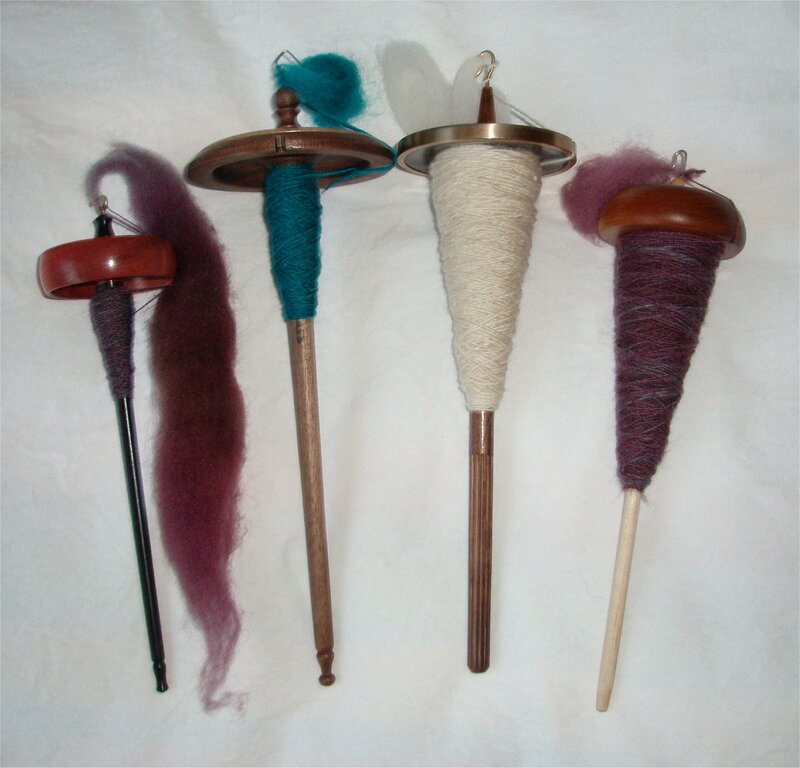 Top whorl spindles have the disc at the top of the stick, can spin faster, and are better for fine yarns as a result. Spun singles are wound below the whorl. Bottom whorl spindles, the traditional type for European spindles, are pretty much the opposite. 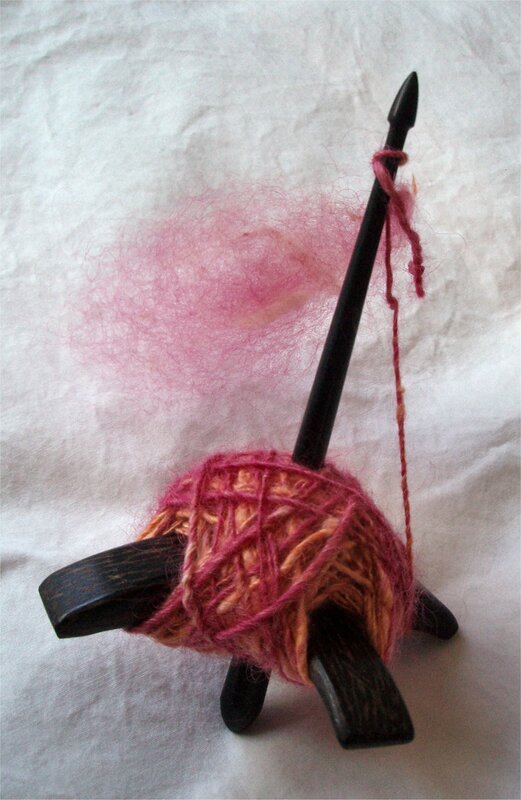 This is a bottom whorl drop spindle, where the yarn is wound on above the whorl. Turkish spindles are a less common variety of bottom whorl spindle. The “X” of wood that makes up the whorl is removable, so your single is automatically packaged in a neat little ball. The yarn is wound around the the X of wood, which is removable. The Navajo spindle is the last type of spindle (I can think of). It is a supported spindle; it doesn’t hang in the air as it spins like the others I’ve mentioned. It’s kind of hard to explain actually. They are really long, 30-34 inches, with a large whorl at the bottom of the stick. You spin by rolling the spindle along your thigh, drafting with the other hand. It’s one handed spinning, and I’m guessing you have to be really, really good to pull it off. My drop spindles are all standard top whorls, but I have a variety of weights and designs. The heavier ones keep spinning for longer, but only work for plying or really thick yarns. Lighter spindles don’t break fine yarns with their own weight. This entry was posted in fiber art and tagged bottom whorl, drop spindles, handspinning, spindles, top whorl, turkish spindles, whorl. Bookmark the permalink. I’ve never tried a drop spindle. It looks difficult. Would you be able to do a short video showing us how to do it, please? Sure! That’s a great idea, actually. Perhaps I’ll have a chance to do that this weekend. Actually, I think in some ways it’s much easier than spinning on a wheel. You only have to coordinate two limbs (your hands), instead of 3 or 4 (hands and feet for treadling). Great! I shall really look forward to watching that, and learning.